I’m always joking around and saying that I’m a Rice & Beans girl… but truth be told that that is no joke at all. I am in fact– a Rice and Beans fanatic. I can eat it everyday twice a day and get tired of it. It reminds of me of home because it is home. Growing up, my grandmother made this dish several times a week. There’s a saying that rice, beans, and Pollo Guisado is the Dominican Flag because it’s a dish we eat day after day! Nonetheless, Dominican Beans are special. They’re a mix of fresh veggies and aromatic herbs that are stewed together to make a dish that will make you weep from joy. I get excited about food all the time, but very very few of them will actually melt my heart and this is one of those dishes. Dominican beans are also special because they contact Kabocha Squash aka auyama, which gives the beans a subtle sweetness. All in all, Dominican Beans are multifaceted and dimensional. It’s a dish that’s packed with layers of flavors much like Dominican heritage. You can see and taste the African and Spanish influences all in one dish. DIshes like this make so excited to perfect because there’s so much culture jam-packed. I love unpacking all the elements because they teach you a lot about yourself. I’ve seen my grandmother make this dish more than any other and yet it’s a dish that took me forever to perfect. I could never get the texture or flavors down packed whether I was making them from scratch or the easy way. When my grandmother passed away, this was also the dish that I didn’t make for a while. It reminded me too much of her. I would make Cuban Black Beans instead while yearning for Dominican Beans. 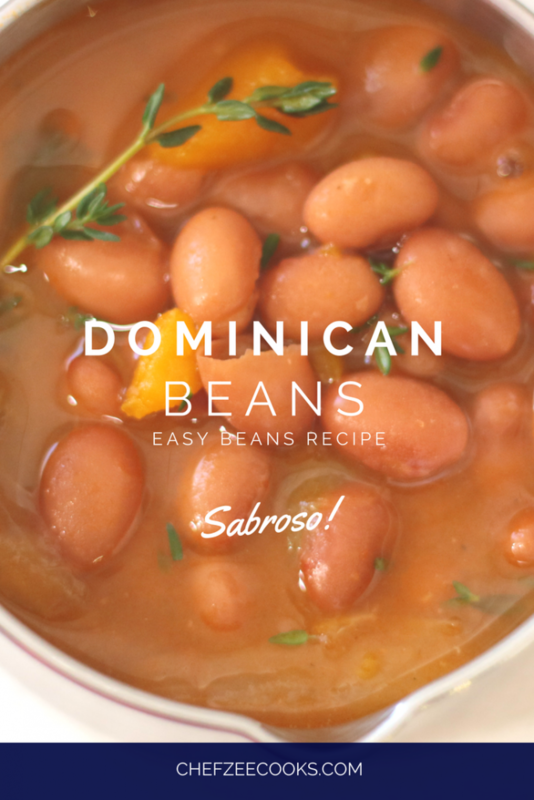 I love both beans with the fervor, but Dominicans hold a slight edge because of my memories. My goal is to share with you the magic of these. Even if you’re no beans lover, just try the sauce. The sauce is to die. It’s liquid gold… and yes I’m biased, but just take my word for it. We start off by making Dominican Beans by sautéing onions, peppers, and garlic then layering on beans, culantro, thyme, and auyama. It’s the perfect medley of flavors. Try it out and let me know what you think. 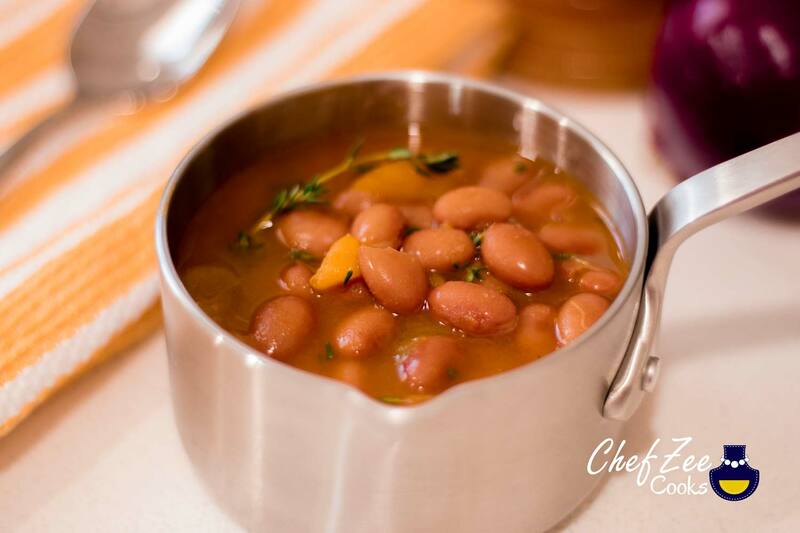 If you’d like to see a step-by-step tutorial on how to make these beans, then watch my videos: How to Make Easy Dominican Beans. Dominican beans taste great with White Rice and Pollo Guisado– Stew Chicken. They also taste better the next day. Let me know if you guys enjoyed this recipe and if you have any questions! Boil for 20-30 minutes until it thickens. I like my beans at a medium thickness. Feel free to add water if your beans get too thick. Note that if you boil it for too long, your squash will dissolve. At the very end, once you get to the thickness that you like, add a pinch of brown sugar and vinegar. This will help balance out all of the awesome flavors. Dominican Beans taste better the next day! The longer you let the beans rest before serving, the better the beans taste! Enjoy. Buen Provecho!